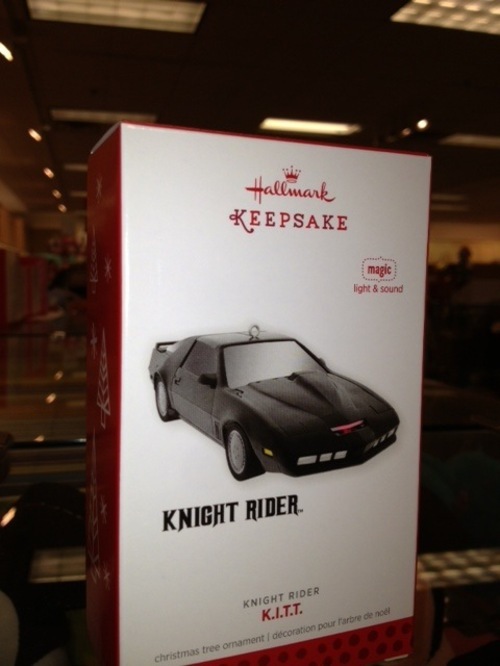 Be sure to remember to stop by your local Hallmark Gold Crown store this weekend for the 2013 Ornament Premiere where you can pick up your very own "KITT" ornament. KITT has the traditional bells and whistles - being battery operated and featuring scanner light effect and spoken phrases. Retails for $19.99. We were able to get a sneak peak today at the packaging - hopefully this will hold you over until Saturday. And while we wouldn't describe KITT in exactly the same way (where is the turbo-boost?) we think it's a rad enough edition to our collection to overlook the oversight.